The Inter-Sorority Council’s rejection of Epsilon Kappa Theta’s shakeout process exacerbates exclusivity in the Greek system. On Thursday, May 10, the Inter-Sorority Council opted to reject Epsilon Kappa Theta’s proposal to continue shakeout, its alternative recruitment process that has been in place since fall of 2014. EKT first went local in 1992 to escape limiting and outdated rules imposed by its former national organization. Since then, EKT’s ability to make autonomous decisions has been central to its growth. Half of the houses that the ISC represents are national sororities that must adhere to strict rules about how members join through a formal recruitment process. Why, then, should the ISC be allowed to govern EKT’s recruitment process? Their decision may be best for the some of the houses the ISC represents, but it is not best for EKT, and it is not best for the community of marginalized students that have found their way into the Greek system since EKT began shakeout. Since EKT began offering shakeout in 2014, EKT has grown into a singular, tight-knit community. Over the past four years, most of the people who joined EKT were deciding between EKT or being unaffiliated. This is because shakeout attracted people who did not see a place for themselves in rush or in the Greek system as a whole. As this shift occurred, everyone who joined was united by the choice to be a part of this specific community, and EKT built a community around common interests, values and priorities. The house is now a haven for women of color, first-generation college students, students from middle to low-income backgrounds and gender nonconforming individuals. The issue of socio-economic diversity was a huge barrier for many potential new members who chose to shakeout at EKT rather than go through formal recruitment. Rush is often inaccessible for students who work multiple jobs and support their families; the amount of time required to participate, and consequent work shifts forfeited, is simply not feasible for most. Even if a potential new member is financially able to partake in rush, it only becomes more difficult once they join a house. Though all PNMs can apply for financial aid, many sororities at Dartmouth arguably embody a culture surrounding finances and wealth that may be prohibitive for students from low-income backgrounds. For example, many houses expect members to pay for gear on top of dues, or pay for sisterhood activities out of pocket. For several years, EKT has ensured that gear or activity costs are covered by the house. Additionally, many other sororities use fines as a punishment for missing events or duties. This is a policy that disproportionately penalizes middle to low-income students. Out of necessity, many of EKT’s members have on campus jobs in addition to a full workload, and it is unfair to punish people who cannot attend certain events as a result. Seeing as rush does not give PNMs full autonomy in where they end up, many PNMs from these backgrounds abstain from the process all together. Shakeout, on the other hand, gave these students a choice. Similarly, EKT has consciously created a welcoming environment for any student who does not identify as a man. The house has adjusted the way it talks about members — phasing out use of the word sister, for example — and cultivated a community grounded in inclusivity and support rather than sisterhood and anatomy. Though the ISC has a non-discrimination clause that says houses cannot discriminate against PNMs based on their non-cisgender identity, this does not mean that all other sororities are a comfortable or welcoming environment for students who do not identify as female. For example, this clause also says people cannot be discriminated against based on race or socioeconomic status, yet some sororities heavily feature wealthy white women. 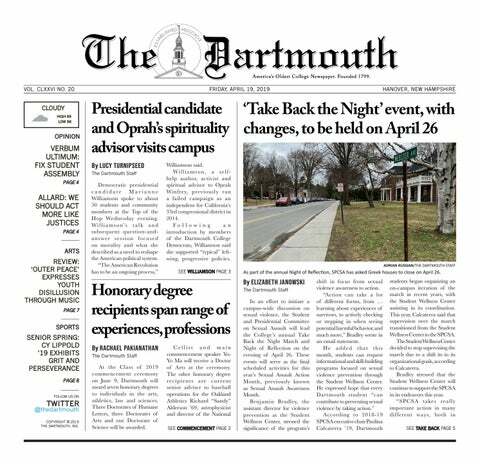 There is no way to force a sorority to alter its membership base, and a sentence that says houses “may not” discriminate on any grounds doesn’t make Dartmouth’s current sorority system any more inclusive for trans or gender-nonconforming PNMs. Suggesting that gender inclusive houses are available for these individuals is also uninformed: there is a difference between gender-inclusive spaces and spaces for non-men. There are people who don’t identify with the traditional sorority membership base who would prefer be a part of a female dominated Greek space, and EKT made this option available. One of the ISC’s responses to these issues is that EKT can continue to open its doors to such PNMs through a Continuous Open Bid process: at the end of formal recruitment, after PNMs get bids, EKT could hold an open house or shakeout-like event. Between fall 2015 and today, only 20 out of 89 members went through rush in addition to shakeout. Given this statistic, it is redundant and wasteful to force EKT to do both processes in order to reach its intended membership base. The ISC believes that this ruling will benefit EKT, but their argument exposes their priorities. The ISC is concerned specifically with the sorority system, not the broader Dartmouth community and the marginalized groups within. Their priorities are their prerogative, but shakeout made Greek life a little more welcoming and inclusive for students consistently left out at Dartmouth. Until the Greek system makes larger reforms to address its structural exclusivity, it is vital for EKT to operate in a way that best serves those affected by this exclusivity. Solomon is a member of the Class of 2017.